UPDATED: Thu., May 17, 2018, 9:59 a.m.
Wells in northeastern Washington frequently have high uranium concentrations, sometimes as much as 40 times the level considered safe for drinking water. A new study from the U.S. Geological Survey sampled water from 13 wells and looked at historical data on uranium concentrations. Half the wells sampled had levels of uranium above 30 micrograms per liter, the Environmental Protection Agency’s standard for drinking water. A Spokane County well along Deer Creek recorded the highest level: 1,180 micrograms per liter of water. Uranium occurs naturally in the rock deposits common in northeastern Washington. The Spokane area is no stranger to its impacts: Many Spokane Indians living near the Midnite Mine, which sold uranium ore to the U.S. Atomic Energy Commission during the Cold War, believe the Superfund site is responsible for high cancer rates among tribe members. Most historical data on uranium levels in groundwater dates from the 1970s, and was gathered for better information about where the radioactive mineral could be mined. Sue Kahle, the USGS hydrologist leading the study, found 60 percent of wells in the historical data had some uranium, and 5 percent had concentrations above safe drinking water guidelines. Exposure to uranium raises the risk of kidney damage and cancer. The Washington Department of Health recommends that private well owners test their levels once and, if high concentrations are found, explore treatment options like reverse osmosis filtration. 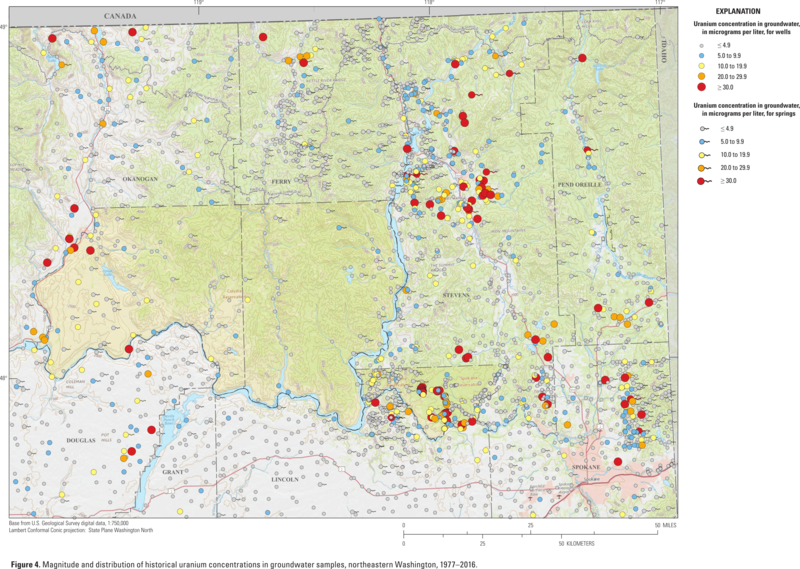 The USGS study included 13,000 square miles of land, encompassing Ferry, Stevens and Pend Oreille counties, most of Spokane County, and parts of Okanogan, Douglas, Grant and Lincoln counties. About 125,000 people in the area get their water from private domestic wells. Kahle will present the study’s results and take questions at 7 p.m. Thursday at Spokane Community College’s Lair Auditorium. She said she hoped the information would help people be aware of the potential for high uranium levels in well water and encourage people to get their water tested. This article has been updated to correct the percentage of historical wells with elevated uranium concentrations. Published: May 16, 2018, 4:07 p.m. Updated: May 17, 2018, 9:59 a.m.